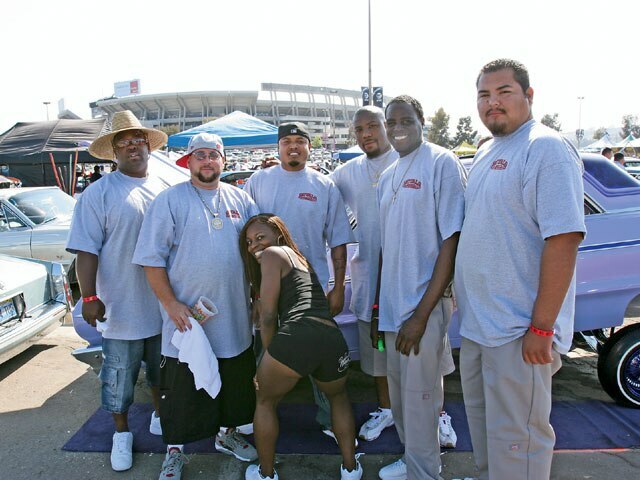 It's Another Memorable Event With Plenty Of Attention-Grabbing Moments. 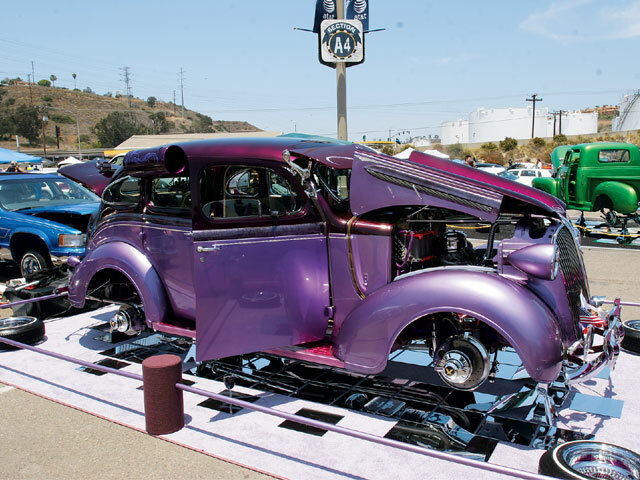 The Lowrider Tour stop in San Diego, California, always turns out to be a memorable event and this year was no different. 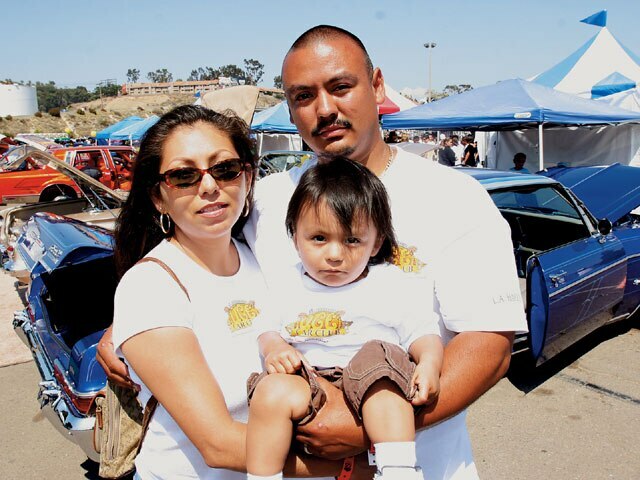 The 30th Anniversary Tour event at Qualcomm Stadium-sponsored by Quaker State, CCE Hydraulics, Hispanic Lending and Thump Records-featured picture-perfect weather, more than 10,000 spectators and close to 600 vehicles, including some new cars that definitely caught our attention. Being the final Southern California Tour event of the year, you can usually count on at least a few builders unveiling their latest creations in San Diego. 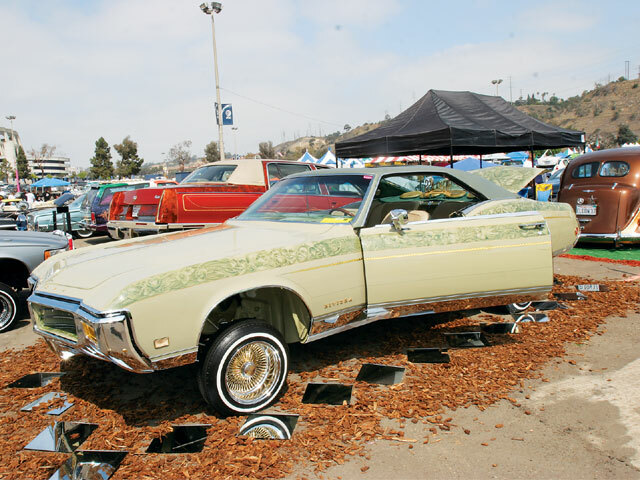 We spotted more than a few cars that deserve to be singled out, including a clean ’69 Buick Riviera owned by Jose Barerra of High Class C.C. This Rivi had it all-paint, interior and undercarriage. 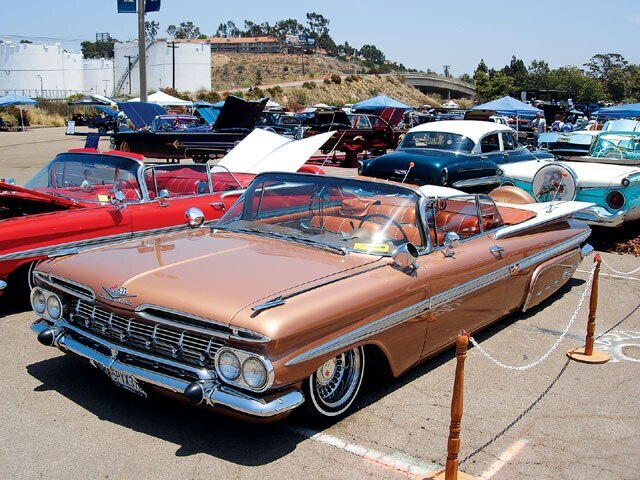 Some of the vehicles have already been featured in Lowrider, while others, such as a clean ’64 Chevy Impala convertible put together by Mark Turner of Major League Restorations, needed to be scheduled for a photo shoot as soon as possible. This San Diego-built ’64 was immaculate and featured a baseball theme; not surprising since the owner is Jacque Jones of the Chicago Cubs. 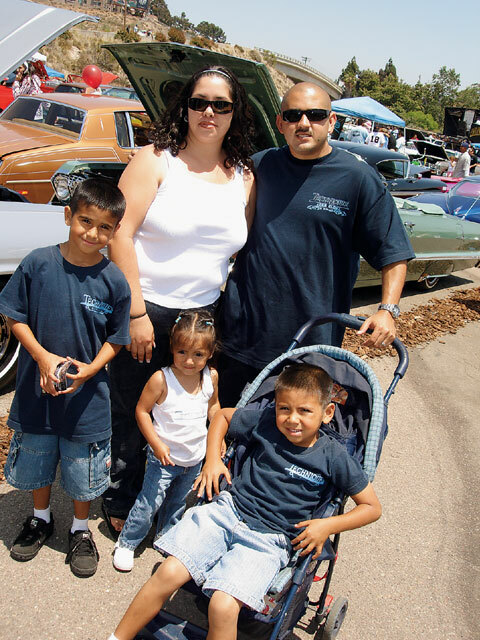 This car’s so clean that it could’ve qualified for the Lowrider Excellence Award with its custom paint and interior. Elsewhere, Robert Cisneros of Klique C.C. showed his ’70 Riviera, which was almost perfect. 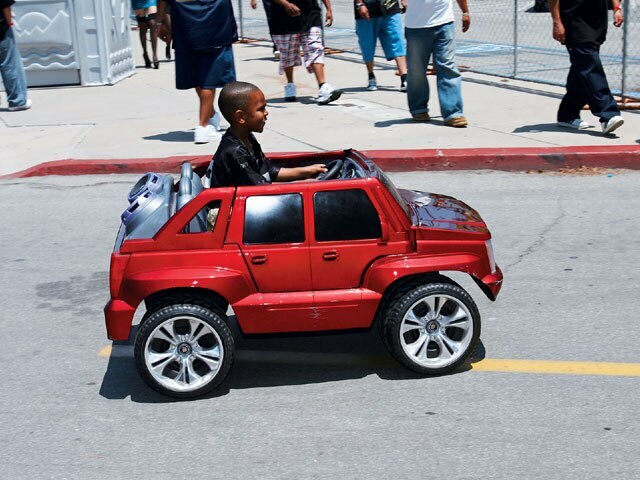 In fact, all Robert had to do was put the car on jackstands to possibly take home a prestigious award. This Rivi was really complemented by his buddy’s candy blue ’71 “boattail” Riviera. 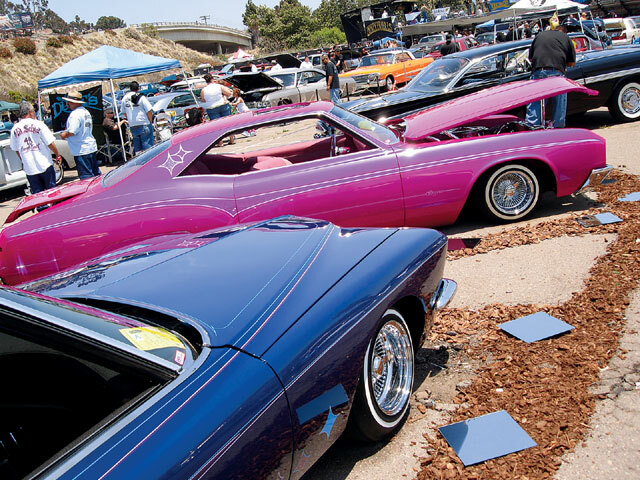 Other cars that made us take a long look included Igarashi’s custom ’59 Impala, and Eddie Saldana’s Rollerz Only C.C. ’63 Chevrolet Impala SS, “Sabroso.” Other cars breaking out included Armando Gonzales’ ’91 Chevy truck from Uniques C.C. Armando’s shooting for Truck of the Year status; we’ll have to see how he does at the end of the year, but right now his truck looks like a real competitor. 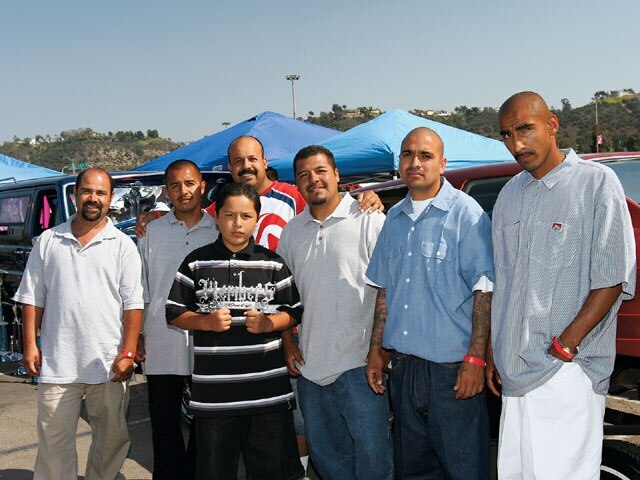 There were car clubs from all over coming out to support the event, including Rollerz Only which showed huge with several cars. 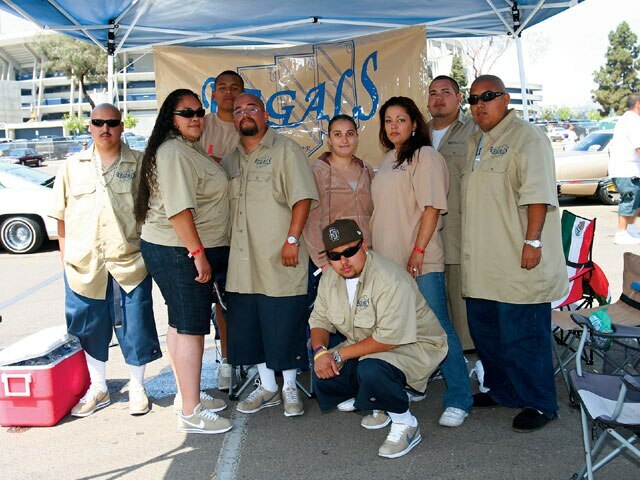 Majestics C.C. held its own as you walked into the show. Oldies C.C. came out to support new LRM Hall of Famer Ricardo Alvarado. Elite C.C. was in the house as well as clubs from Las Vegas, Nevada, including Royals C.C. It seemed like they were all here-Klique, Groupe, Casuals, Uce, Ultimate Riders, Latin Life… you name it, they were here. 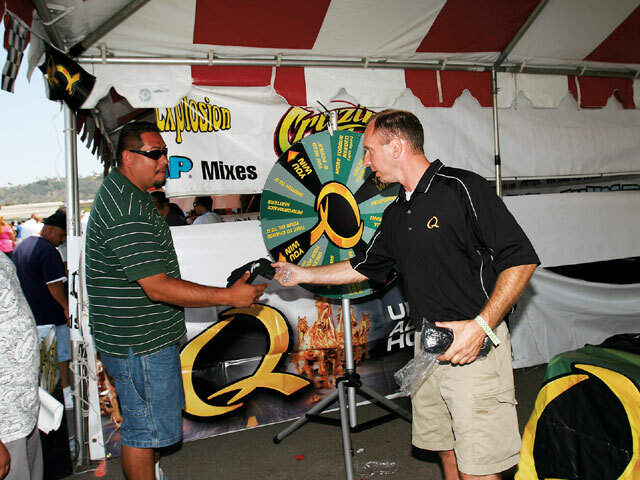 During the show we walked around vendor’s row and stopped to talk to a few of the guys doing their thing, including MIC (Master Image Customs) who answered suspension questions, and Truucha who was dealing his popular DVDs. Wanted had the crowd stopping by to take a look at their clothing line, Lowrider Shades had a booth showing off their coolest sunglasses, and the upcoming San Diego Super Custom Indoor Car Show was being promoted by two of San Diego’s finest females. There were many pretty girls at the show, some of whom came out to see the concert featuring performances by Mr. Capone, MC Magic and Oakland, California, superstar Too $hort who sang hits like “Shake That Monkey” and “Blow The Whistle.” Once the stage was cleared, Kid Jay spun the turntables for the famous Bikini Contest, the perfect grand finale to a full day of cars, girls, hydraulics and live performances. Make sure to stop on by the next Tour stop in your area to see what you’ve been missing. 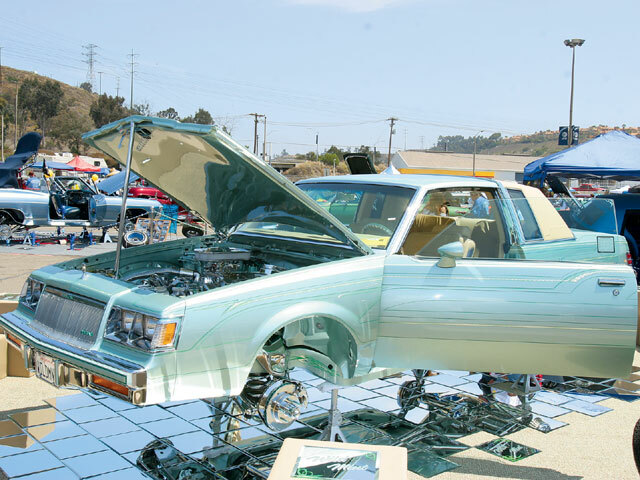 As they say, there’s no party like a lowrider party. 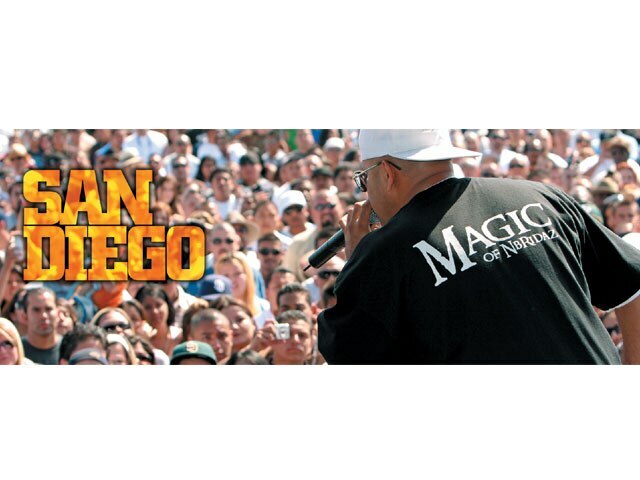 “Magic” of NB Ridaz casts his spell on the girls. This pair of Klique C.C. Rivieras represented San Diego properly. The Jimenez familia made it a family event. Regals C.C. keeps its cool representing San Diego. This Uce C.C. bomb is one clean OG. This little homie came to the show ready with a custom candy painted, rimmed-up, bass-bumpin’ baby H2. 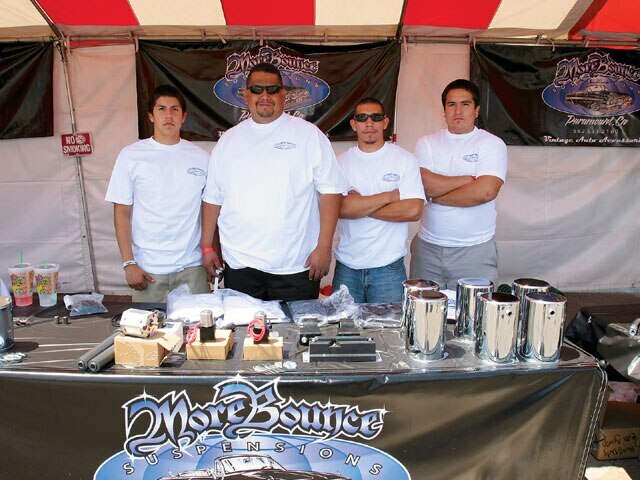 More Bounce was in the house selling their gear. Latin Style C.C. lookin’ good. “Wild Mint” is a fresh Buick Regal. Royals C.C. knows how to talk to the ladies. 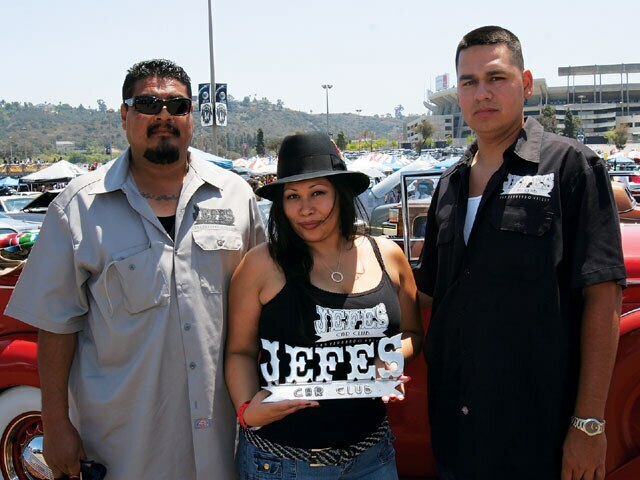 Jefes C.C. came down from the valle of San Fernando to enjoy the show. 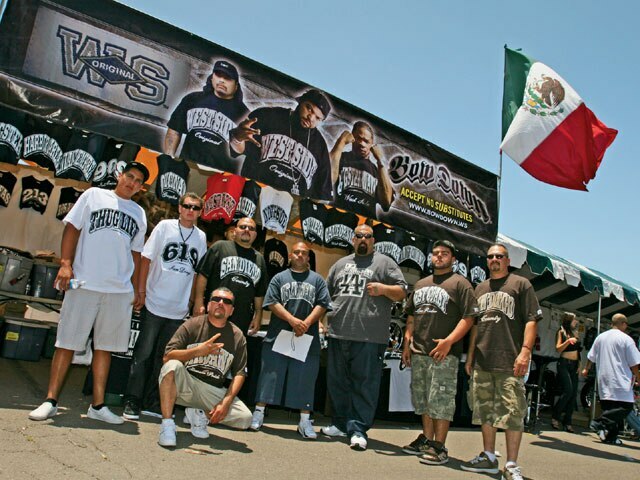 The WestSide Original crew showed up at the show eight strong. Taku, Chiharu and Yasu pose with one fine ’59 Impala. Jose Barerra’s ’69 Riviera revs it up for High Class C.C. 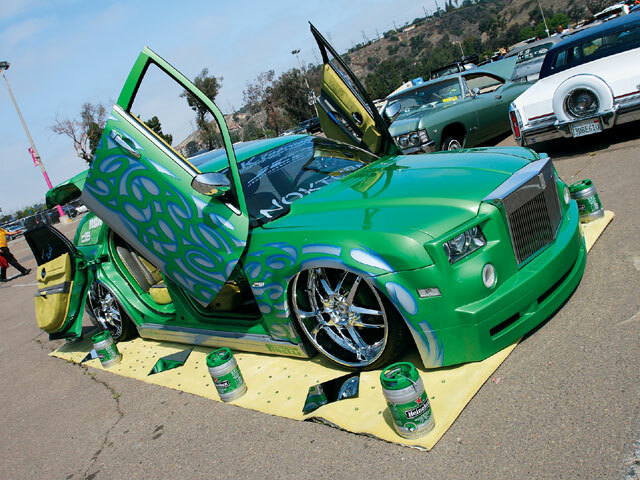 Check out the Rolls-Royce front end conversion on this bagged candy green ’05 Dodge Magnum owned by Rudy Tell. Members Only C.C. members show their brotherhood. 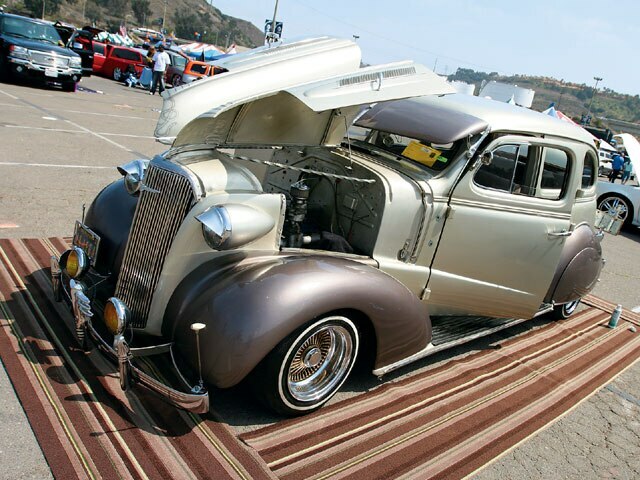 Adrian Sandoval detailed his ’36 for more than two hours but it paid off with the way that his car looked laid out in the sun. Jesse’s convertible is one clean piece of machinery. The Quaker State booth gave away goodies all day long. This Techniques family takes in the show.